A ley of contrasts. It runs N.W. for 9 & ½ miles from the SE of Leicester, across the city's most ancient quarter, then over one of its industrial areas, finally reaching picturesque Bradgate Park on Charnwood Forrest. The development of an alignment discovered in the field by David Potts. The ley commences in the SE at the former village green at Oadby. Little of this is now left except a lawn and a seat, but the name of the inn alongside remembers the spot and depicts a maypole on its sign. Next to the village green is the church of St. Peter (62350038), where the external part of the building is almost entirely early 14th century. The ley's bearing seems to graze the SW corner of the tower. Travelling NW, the ley crosses Leicester, passing through Stoneygate, Victoria Park, one end of the old market place and Cank Street, named after an ancient well situated there. If a line were to be drawn across an old section of the city, this would be one of the more acceptable possibilities; if leys are 'chance' how strange that such coincidences occur. Leicester was founded, according to legend, by King Lear, son of the magical monarch Bladud. When the Romans came to the city's site they found a Belgic settlement already established. The Romans considered what is now called High Cross in Leicester to be the centre of England. In medieval times a pageant called ' The Riding of the George' used to take place in the streets of Leicester, with a parade of effigies depicting St. George and the Dragon. Shortly after the market-place, the ley reaches All Saints Church (58290484) in Highcross Street. This dates from a least Norman times, and its tower may possibly be of that period. All Saints is hemmed in by building, and from the church the ley enters the curiously named Frog Island, an industrial part of the city, passing at an angle down New Pingle Street. This is now on an industrial part of the city, passing at an angle down New Pingle Street. This is now on an industrial but 'pingle' in Leicestershire dialect usually denotes an old track. The pingle was probably prefixed by 'new' as the area became built up. At the end of this street, and on the ley, is the Britella factory (58050510) which apparently was haunted by a spectre so unpleasant that the work force demanded that the place be exorcised if they were to carry on working. This could be an example of the sort of thing the feng shui geomancers in China were anxious to avoid. Leicester - its centre and environs - has had its skies occupied by some truly remarkable UFOs over the years, far too many to itemize here. The city is a minor 'ufocal'. Leaving the city, the ley goes through a crossroads named Woodgate (57700550). Dead wood from Leicester Forest was brought to the old Wood Gate of the city, where it was bought cheaply by the inhabitants. The ley goes on towards Anstey, with Anstey Lane writhing back and forth across its course. In a letter to Flying Saucer Review (Vol.15,No.1 Jan/Feb 1969) a Leicester woman described an experience that had taken place forty years previously 'in the fields along Anstey Lane', when she was a child. While her father dozed in the sun she became aware of a figure all in black and 'without a face', which she thought was a scarecrow. Near the figure was what she took to be a globular 'hut'. Feeling the thing was watching her, she aroused her father but, on looking up again, both it and sphere were gone. Only decades later, when her son showed her an 'absolutely identical' incident in the Review did she realize the experience could only have been a close UFO/humanoid encounter. This event must have taken place either on the ley or very close to it. 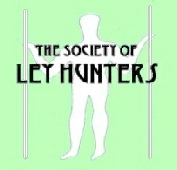 The next ley marker is a stone about 5 feet high in a ridge and furrow field a little S. of Anstey. This is not marked on the maps, but is approximately at 55260820. There can be no doubt about its situation on the ley, however, because the stone, the church at Anstey, and the notch on Old John Hill (at the NW end of the ley) visually align. No one seems to know much about the stone, but the farmer considers it to be ancient and not a rubbing post. The stone and alignment can be viewed from the road, but seek permission from Mill Farm if you intend to inspect the stone at close quarters. The church (54940857) in Anstey is dedicated to St. Mary and is 14th century but heavily rebuilt in the 19th century. One meaning of the name 'Anstey' is 'narrow path'. In 1958 a UFO was seen over Anstey by three witnesses, one of whom was a member of the Leicester Astronomical Society. After Anstey, the ley enters Bradgate Park because this had formerly been a country park, later acquired for the people of Leicestershire, the terrain of Bradgate presents the landscape as it must have looked hundreds of years ago. The best entrance to the park for investigating this ley is at Newtown Linford. The ley cuts through the walled grounds of ruined Bradgate House (53401018) where a 'White Lady' ghost is reported from time to time. This is thought to be the phantom of Lady Jane Grey, who was born in the 15th century house. The ley can be followed on foot through the ancient landscape (where exposed pre-Cambrian rock can be found) to Old John hill, so named because of a folly tower on its highest point, said to have been built by a local squire in memory of 'Old John', one of his servants. The hill is the focus for this ley, which goes through a notch (5241122) formed by the edge of an ancient copse and the spur of rock on which the tower stands. It can be seen, however, that the copse itself occupies a larger notch or dip on the summit of the hill, and this must once have been a major landmark, for the summit can be seen over much of W. Leicestershire. A track-wide, well-beaten and presumably very old runs up the side of the hill exactly on the ley. In 1957 Charnwood was the epicentre of an earthquake that affected eleven counties. Shortly before it occurred, people in Bradgate Park saw 'tadpole-shaped lights' in the sky, travelling in a linear formation. An article, ‘Aids to map and field work’ in newsletter #39 of August 2011, extended this alignment with another church between St. Peter’s and All Saints; Stoneygate Baptists (4606030229). Then a further three sites to the northwest; Bawdon Monolith (4498531400), St. James the Greater church on Charley Road in Charnwood (4473031637), and the Breedon Lodge Farm Moat (4418032220). An overall distance of 30km, on bearing 317.2°/137.2°.